The reverse side of this first half disme featured a flying eagle with the inscriptions “HALF DISME” and “UNITED STATES OF AMERICA.” On the obverse, surrounding the Liberty portrait were the words “LIB. PAR. OF SCIENCE & INDUSTRY.” Approximately 1,500 silver half dismes were struck in July of 1792, but very few of these remain. During the years that followed many different variants of half dimes were struck. Because the U.S. coin design and minting processes were new and some of the minting equipment being used was old, many varieties exist, not all of them the result of coin errors. In the first half of the 19th century millions more half dimes were struck to fill the need for small coinage, but like all silver and gold coins, they disappeared from circulation during the Civil War. They had more value to people as bullion. 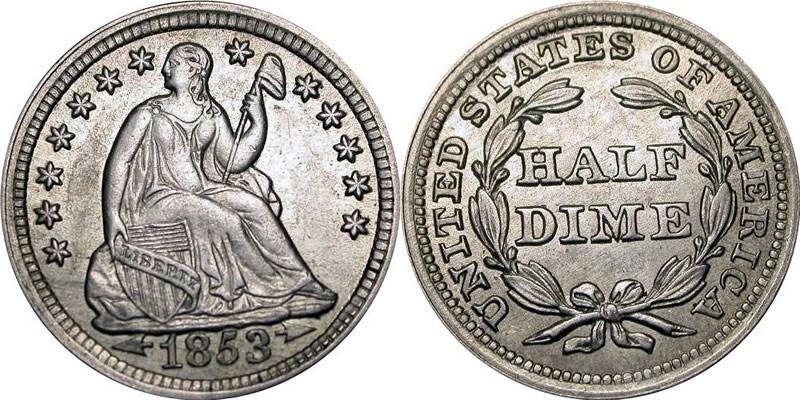 In 1866, the 5-cent Shield Nickel was first minted as a solution to the problem of coin scarcity. Joseph Wharton, a nickel mine and refinery owner, lobbied members of Congress to produce coins composed of 25% nickel and 75% copper. He was successful first when a 3-cent coin was minted in 1865. The Shield Nickel followed the next year. The half dime was around until 1873 when it was abolished by the Coinage Act of 1873. In the West the half dime lingered on in use for 20 years because nickels were only struck at the Philadelphia mint, and the population out West needed small-denomination coins desperately. Many half dimes were made into jewelry - stickpins, bracelets, or buttons - so some of the ones that remain are damaged on the reverse. You may come across others with holes bored into them. The half dime is a fascinating piece of American history from its start to its finish. If you’d like to add one or more variety of this historic coin to your collection, contact us at Mullen Coins. We would be happy to help you meet that goal.